Radio Alarm from EnsightMedia is an iPhone and iPod touch app that gives you streaming internet radio, Alarm Clock, Nature Sounds and Sleep Timer – all in one mutlitasking app that addresses all the usual nuances of alarm clock apps. Radio Alarm’s app icon, graphics and layout are all reminiscent of an antique analog radio but the functionality is nothing short of contemporary. Break out of the painful alarm clocks of the past and check into this snug comfy app that feels right at home on your iPhone. On the main screen you have an a digital date calendar with flip style graphics, an analog clock, two dial sliders for volume and brightness control, and 4 function buttons: Alarm, Radio, Sleep, Channels, and Settings. 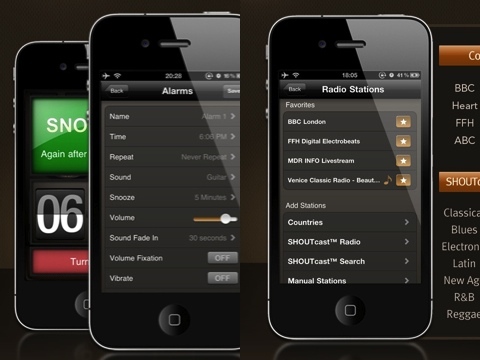 Radio Alarm is more than just an alarm Clock app. For starters you get a full featured internet radio player using SHOUTCAST with close to 40,000 stations neatly tucked into multiple layered categories. Just tap the “Radio” button and Radio Alarm runs a scan for the last played station on the foreground as it preloads the stream using your 3G/WiFi connection. While this buffering is happening, instead of leaving you in silence, Radio Alarm plays a random dial scanning sound as if you were turning the knob yourself. Very clever and natural! Since there are a ton a stations to discover, you can star the ones you like which show up on the Radio Stations main screen. Going into the 25 main SHOUTCAST radio genres, you’ll find everything from Alternative, Jazz, Metal, Rap, Rock, Reggae and my personal favorite Talk. Talk radio sub-genres include things like Educational, Comedy, News, Political, and Sports. In the sports category alone there are hundreds of live stations you can listen to from around the US and World. The stations are listed by name only which is my one of few complaints on this app. Given the enormous amount of choices it would be nice to be able to sort stations by popularity/listener count, and or bitrate. The second missing feature is keyword search which would be a nice addition for users who want to find their favorite station by name. Sleep Timer and Alarms can be setup and customized in the Settings section. Here you can also edit the application’s general settings like prevent Auto-lock, Sound Effects, WiFi playback only, and Feedback. Add alarms lets you customize the time, sound, repeat, snooze, volume, fade-in, vibrate and shake. Sounds you can choose besides the default ones are Radio, MP3 and you can even record your own audio to wake up to. Choose specific days of the week and length of snoozing. The Sound Fade In feature is perfect for waking you up slowly. Radio Alarm actually increases your iPhone volume little by little, starting from muted, as it plays whatever sound you chose! The shake feature is also pretty awesome. Instead of tapping a button, you shake your iPhone to snooze it in the morning. Just make sure you don’t throw it! Active alarms can be turned on/off easily. Since the app runs in the background using iOS 4, the alarm turns on even if you close the app for iPhone 4 users. I’m not sure how well this scenario is handled for 3GS users. You can set a sleep timer to listen to whatever you want and have it even fade out at the end. You can fall asleep to your iPod music, nature sounds, or internet radio. – Downloaded alarm sounds: The first time you run the app, it will download some alarm sounds, which could take a long time if you’re on 3G. – Stations have been added for various countries around the world. You can browse them by name although it is very difficult to find the station you want, since there is no option to find local stations in your city automatically. 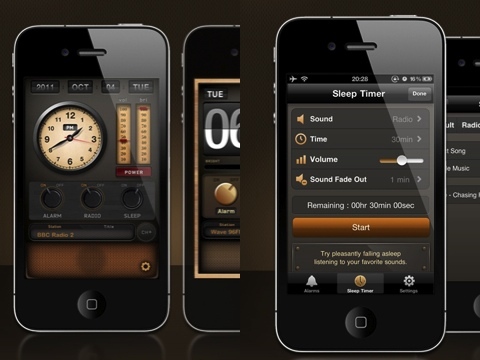 – Sleep timer is now available useful for falling sleep to music, sound effects or radio stations. Overall, Radio Alarm is a powerful iPhone alarm and internet radio player combo that looks good and is stable enough to be trustworthy as an alarm clock app. The price is currently at $2 which is a pretty good deal. AppSafari review of Radio Alarm Clock – MP3/Radio/Nature Sound Alarm + Sleep Timer was written by Joe Seifi on July 28th, 2010 and categorized under App Store, Calendar, Featured, Music, Radio, Utilities. Page viewed 10799 times, 3 so far today. Need help on using these apps? Please read the Help Page. Looks good! and Works great! Thanks for the awesome application. Good! I love those shout cast channels! First of all i must say it’s a great clock radio app. I already used Sonio clockradio and also TimeTuner is nice. * have the option to add your own MP3 streams at favorites. * Make a separate radiostation list per country with (fm) stations. I could provide you with station and mp3 streams for Belgium and The Netherlands. Quite a few are not on Shoutcast but have mp3 streams. * Option to choose a playlist instead of max. 10 mp3. * Have the alarm radio with e.g Radio station X and have sleep with station Y. * have access to RadioTime.com music catalog (a feature that other clock/streaming apps have: ‘TimeTuner’ and ‘TuneIn Radio’ have. * RadioTime also has .wma/asx streams which do work within the previous 2 mentioned apps it would be great to also have that feature in your app so I can listen to e.g. BBC (from the UK). * add your own list of Radiostation streams besides the one from Shoutcast or either use RadioTime. A option such as Country > stations from that country. Quite a lot of stations do have mp3/shoutcast streams but are not shown on Shoutcast.com such as the Dutch,UK,Belgian,Austrian stations. I like the app but I continually get errors when trying to use the shoutcast stations as alarm sounds. They almost never play. Another thing I have trouble with is when I try to connect to a shoutcast station and it won’t connect, it continues to search for the station. I have to turn off the phone to get it to stop searching. Why cant i get my station to work in the latest wersion? It worked before. The station that i would to have is Sveriges Radio P4 Göteborg.